Connect them all - Thermostats, Door locks, Light switches, and Surveillance cameras. American Heating and Cooling also installs Nexia products to remotely control Door locks, Light switches, Light modules, Garage door openers, and about 10,000 other items. Residents and Second Home Owners at the Lake of the Ozarks are adding Home Automation Technology. If your pipes spring a leak, the sensor will get wet and automatically shut off the water. This can mean BIG savings by limiting water damage and saving you the cost of repairs. Home Automation systems offer Safety, Security, Protection of your Investments, and Peace of Mind. Why have an Air Purification System? Tom at American Heating and Cooling recommends replacing filters once per month. Air purification helps with multiple allergens and are very affordable. Tom advises against buying the most expensive, pleated filters as they restrict airflow. Tom always suggests buying the regular fiberglass filters, which are inexpensive. Let us help choose the right system for your needs. American Heating and Cooling Air Purification Services are Affordable. We back them with an available 10-year parts and labor warranty on new systems. from Trane, Bryant, Aprilaire, and Tempstar. 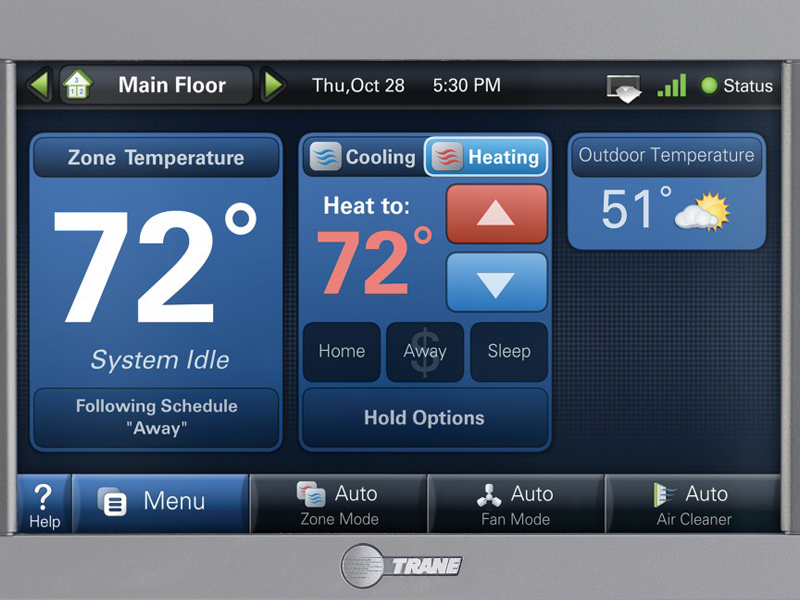 We are an authorized Trane ComfortLink dealer. from anywhere you have an internet connection. then log in remotely to turn it down just before you get home.